An astronaut aboard the International Space Station captured this incredible view of Earth's horizon on March 6, 2012. The image shows the southern lights, or aurora australis, on the right, and daybreak on the left. An exquisite photo of Earth's horizon taken from the International Space Station reveals the glimmer of daybreak on one side, offset by dazzling auroras over the planet's South Pole region on the other in this amazing space wallpaper. 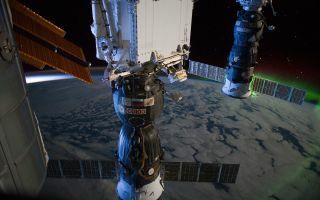 The remarkable view was captured by one of the astronauts living aboard the International Space Station on March 6, as the orbiting outpost flew over the Indian Ocean, roughly 1,200 miles (1,930 kilometers) south of Australia.